Hello everyone! I hope you all had a fabulous weekend. Things around here were fairly quiet this weekend, it was a fabulous way to end a fairly busy week. As most of you know I’m working at putting together a Holidays Planner, and I’m inviting you all to come along for the ride. 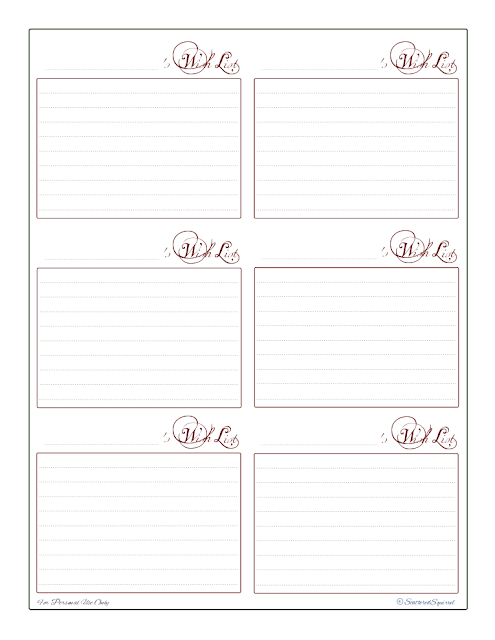 Along the way I’m going to be sharing ALL the printables I’m creating. I’ve also put it out there, and I just wanted to say it again, I’m taking requests for printables. If there is one you really want to see, leave me a comment, send me an email, I’m on Facebook, Twitter, and Google+, and I will see what I can do. Lots of info, I know, but this allows me to keep my eyes open for items that my friends and family will enjoy. I’m also hoping it will push me to think more outside the box when I’m doing the shopping. For those of you are looking for something a little more simple, this next one might just fit that bill. Wishlists are great, but what about the actual gift buying? This year, well, I guess technically it will be next year, I want to start shopping early. The boys are FINALLY at ages where I can start doing this. Liam has settled into “big kid” toys, and our Teen has finally gotten out of that strange in between place where he was too old for toys, but still young enough to kind of want them. Also, I want to keep a close eye on what we’re spending. I may loving giving gifts, but I don’t always love the price tag that comes along with it. So, I created a Gift Giving Tracker to help me keep track of who I’ve gotten a gift for, what it is, either where I got it, or where I’ve hidden it, as well as what it cost. 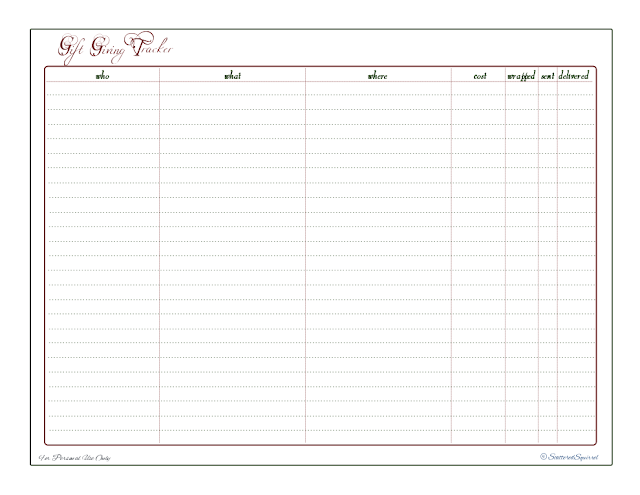 I added in columns for checking off if it’s been wrapped, sent or delivered. This way, if I am purchasing ahead of time I’ll know where I’m at with each gift. 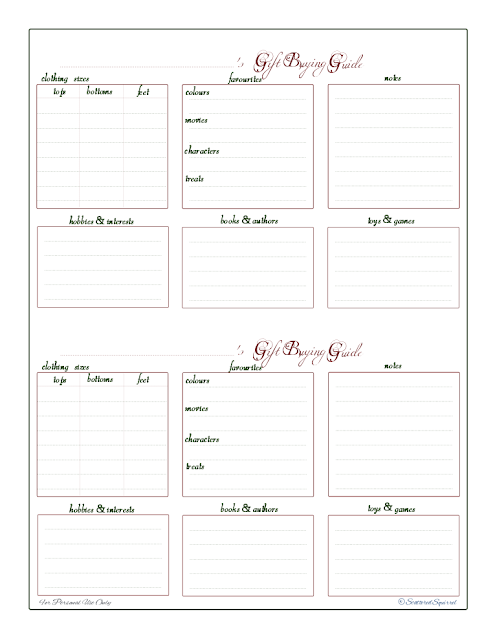 With these printables I think I’m going to have gift buying and giving in the bag this year. It’s an absolutely wonderful feeling to start the holiday season feeling like I’ve got a plan. I don’t feel so out of control. So, with greeting cards and gift buying taken care of, what’s next? I’m leaning towards something to help plan and prep for holiday baking, because I know we’re going to be starting soon, but I’m also sort of leaning towards something to help plan home-made gifts….. I’m not sure. It will probably be one of those two categories. 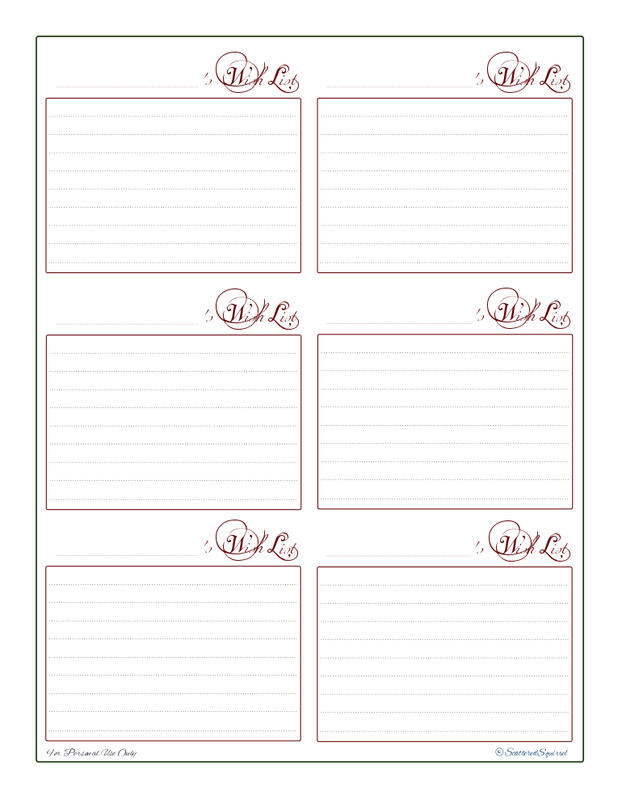 So, tell me, are you liking the printables so far? Anything I missed? Which would you use more, printables for planning holiday baking or for planning home-made gifts? I’d love to hear your thoughts!